Nonstick cookware and bakeware can produce chef-quality results if you take the time and effort to use and care for it properly. Improper cleaning can warp or ruin the nonstick cookware. While you should always check with your product's manufacturer for specific recommendations, there are some general cleaning rules that will help garner top performance and durability from your nonstick cookware. Before using new cookware for the first time, wash it with hot, soapy water, rinse well, and dry it thoroughly with a soft cotton or linen towel. To ensure nonstick performance from the start, it has been standard practice to "season" or "condition" the pan by lightly coating the surface with any type of cooking oil, baking it, and wiping it clean. At least one maker, Calphalon, says this one-time seasoning is not necessary for nonstick cookware. Clean your nonstick cookware after every use. Keeping your nonstick cookware clean will provide a more consistent, quality performance. Any food residue or leftover grease will cook into the surface and carbonize, causing food to stick. That cooked-on residue is hard to see and even more difficult to remove, so wash carefully and thoroughly every time. It's essential to let the cookware cool completely before washing; immersing a hot pan in cooler water could permanently warp and ruin it. Though it's tempting to load the pans into the dishwasher, resist the convenience and always wash nonstick cookware by hand with hot, soapy water using only a dish detergent made for hand washing. The high heat of a standard home dishwasher can not only ruin nonstick surfaces but also void the warranty. Take care never to use harsh cleaning agents such as bleach, abrasive cleansers, or other chemicals on nonstick surfaces. 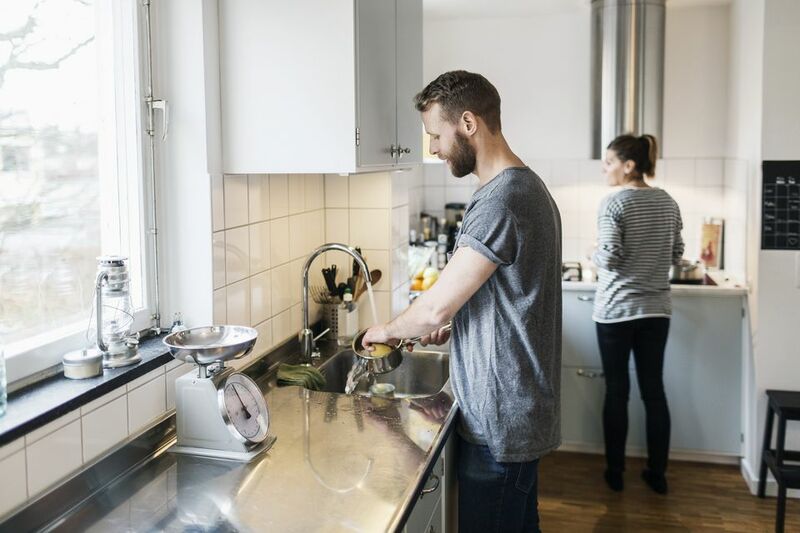 Though it's best to handle these pots and pans as if they're fragile, you can scrub off stubborn messes with some elbow grease and a washcloth, sponge, nylon scrubber or nylon net-wrapped sponge such as a Dobie pad. To avoid the risk of residue and the resulting carbonization, it's a good habit to wash each piece twice to ensure that every last trace of food and oil or butter is removed. It's important to never use abrasives such as steel wool, stiff brushes, or scouring pads, which will scratch the surface and ruin your cookware. Be sure to rinse thoroughly, making sure that all soapy residue has been rinsed and removed. Dry each piece completely. Use a dishcloth or clean rag. Careful storage is important for the lifespan and performance of nonstick cookware. Most manufacturers recommend storing your cookware on a hanging pot rack with plenty of room between items. Don't worry if you don't have a hanging rack. You can safely store your cookware in a cabinet by layering a soft cloth, such as a baby's receiving blanket or an oversize dish towel, between each pot and pan to protect the nonstick surface from coming into contact with bare metal, which can scratch or damage it. Probably the most important rule with nonstick cookware is to never use metal utensils on your nonstick surfaces; they can damage the coating in a split second. Opt instead for materials like wood, nylon, plastic, rubber or silicone, or use specially coated utensils designed for nonstick surfaces. Never cut into the food you're cooking with a knife; it's a sure way to damage the surface and void the warranty. Also, do not use a nonstick pan under the broiler or bake at temperatures higher than 450 degrees Fahrenheit. The intense heat will damage the finish. The greatest advantage of nonstick cookware is that it needs no butter or oil to release the food cleanly, but you can certainly add fats for taste and texture. It's the perfect cookware for people who are watching their weight or cholesterol levels or who are following a heart-healthy menu. There are fat-free cooking sprays perfect for use with nonstick cookware; they ensure easy release and don't add any fat or calories to the food. Whether you invest in a high-quality set of cookware or buy one bargain pan, you can greatly extend the lifespan of your nonstick cookware with careful use, meticulous cleaning, and mindful storage.